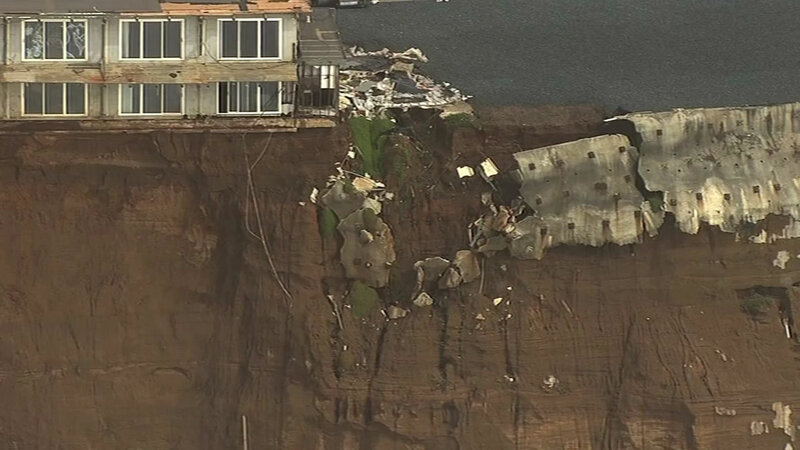 PACIFICA, Calif. (KGO) -- City officials in Pacifica are asking the Pacifica Emergency Preparedness and Safety Commission to uphold the mandatory evacuation of the coastal apartments at 310 Esplanade Ave., nearly two months after the building was first declared uninhabitable due to a rapidly eroding cliff. The city is also asking the safety commission to reject an appeal by some of the buildings residents who want to overturn the city's decision, according to city officials. On March 14, construction crews demolished the adjacent apartment complex located at 320 Esplanade Ave. The 320 Esplanade Ave. location and another adjacent apartment building at 330 Esplanade Ave. were both declared uninhabitable in 2010 as the bluffs below them eroded to dangerous levels, according to the city. On Jan. 22, the city declared a state of emergency after January storms caused $3.5 million in damage to the city's seawall and promenade along Beach Boulevard. The storms also damaged the Pacifica Pier. On Jan. 25, the apartments at 310 Esplanade were declared uninhabitable by city officials, as strong waves caused by El Nino storms accelerated the cliff's erosion. "Worsening conditions on the bluffs beneath 310 Esplanade present a clear and imminent danger to residents," Pacifica City Manager and Director of Emergency Service Lorie Tinfow said in a statement. "We are urging the Pacifica Emergency Preparedness and Safety Commission to honor our designation of this structure as unsafe and help us prevent harm and the loss of life that could result from these hazardous conditions," Tinfow said. The city is working with the American Red Cross to provide shelter to residents that lived at 310 Esplanade who have been displaced. At least 14 former tenants have already found permanent housing, according to the city. San Mateo County has committed about $20,000 to provide displaced residents with security deposits, rent assistance and to help cover motel stays. Additionally, several residents with Housing Authority vouchers are also being assisted by Adobe Services, an agency contacted but the Housing Authority to help the county's residents find housing. "We are dedicating our efforts to provide resources and support needed by the displaced households during this difficult time," executive director with the Pacifica Resource Center Anita Rees said in a statement. The city's safety commission is set to meet Wednesday at 6:30 p.m. in the Pacifica City Hall Chambers. Click here to download the ABC7 News App to get your weather forecast and severe weather alerts on the go, and click here for full coverage on El Nino. What's the weather like #whereyoulive? Share your photos and videos on Twitter, Instagram, or Facebook by tagging them #abc7now. Your photos may be shown online or on-air!